Originally, we had planned to go to Kosovo on Sunday, but there weren't any tickets for Prizren, and there were elections so we didn't want to go to the capital in case there was any sort of political unrest. 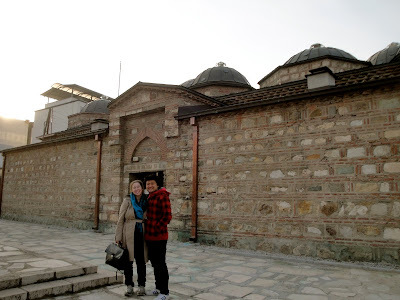 It worked out well in the end, because BH's friends, Radmila and Zoran, gave us a great tour of the city and informed us of the history of Skopje. We started out by seeing an art museum near the head of the main street. Apparently, there was an earthquake in Macedonia that destroyed a bunch of buildings in the area. 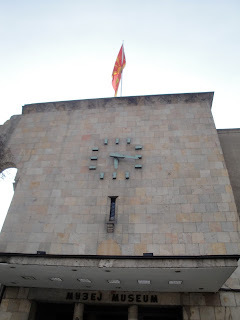 A clock on the museum was not destroyed, and it continues to show the time of the earthquake in 1963. Pretty fun stuff. 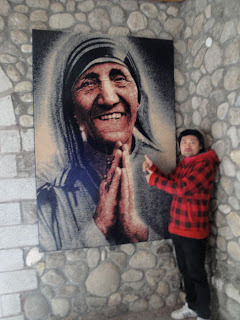 Afterward, we went on to see a church built in honor of Mother Theresa. 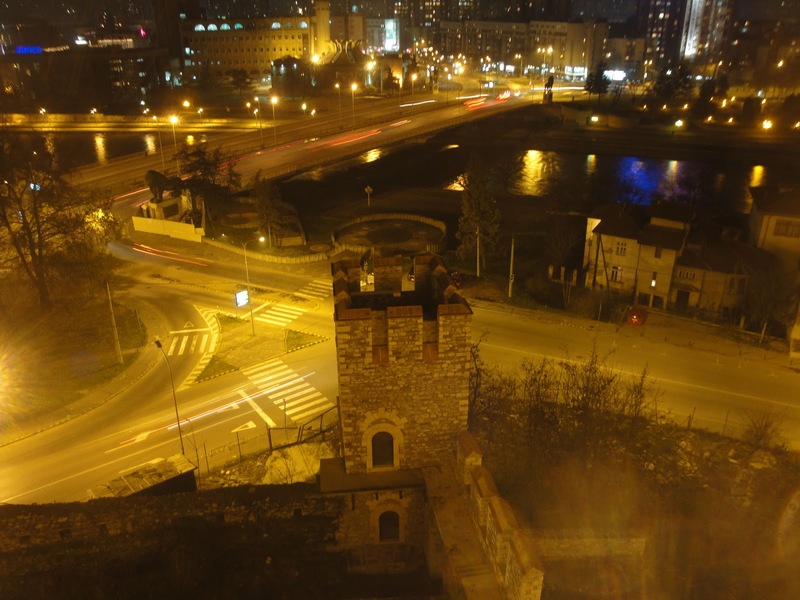 Although she is ethnically Albanian, she was born in what is now modern-day Skopje. The whole time, I was thinking of Alice from Korea, and her beef with Mother Theresa. She supposedly wasn't the complete saint that society paints her as. Then again, she probably did do a lot of good as well. 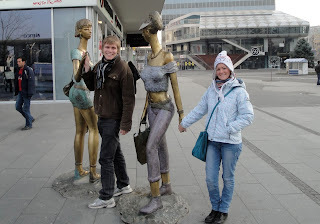 As we continued along the main drag, we noticed a lot of statues that we hadn't seen before. Skopje really has a nice collection of art downtown. (This is something Sofia is lacking) I liked this one with the two ladies shopping. Alongside the river there is a bunch of construction. I asked Radmila about it, and it seems like they are building some sort of Greek-style colosseum. Greece probably isn't happy about that. One of the barriers for Macedonians entry into the EU is their name. Greek does not like that they are using the name, since there is also a Greek Macedonia. That's why it was known as the former Yugoslav Republic of Macedonia when becoming a member of the UN. Anyways, their was a decent amount of construction in the city, and it should be interesting to see the developments in the coming years. Crossing the 15th century old stone bridge, we came to a Turkish hamam (bath house) that had been converted into a modern art gallery. The art was so-so, and in the cold weather it would have been much grander to take a nice steamy bath. I miss Korean bathhouses. Continuing on, we came to the Grand Market, which is the biggest in the Balkans. We saw some churches, and after a bit realized we were starving. 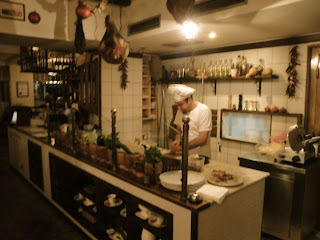 We wanted to have traditional Macedonian food, but had some communication problems and ended up at an Italian restaurant. This restaurant, however, was amazing. And cheap. The pizza was great, the pasta was fresh, the seafood was nice, and the bread. Yum. 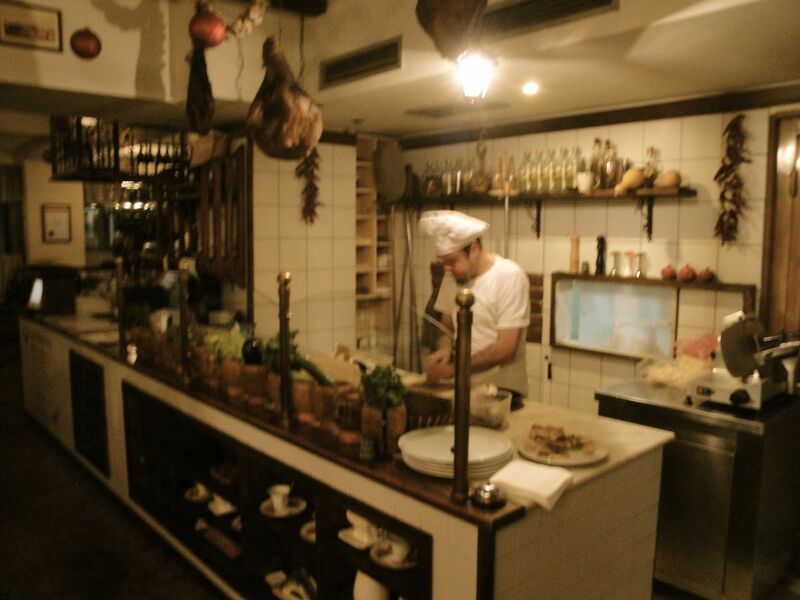 If you end up in Skopje, you need to try out this restaurant. It is called Gusto. At this point, Kristin was a little tuckered out. However, the rest of the group kept on, and visited the Kale Fortress at night. Although it was a little boring to walk around the whole fortress, it had some nice views. By this time, I was also tuckered out and headed home. We had a second dinner a the mall, Turkish pizza, yum, and then I headed to dreamland. The next morning was a day of Christmas shopping, kebabs, and then the bus back to Bulgaria. Although the entire trip was less than a week, it was phenom.